Images of young men and women bearing shunted glances and ambiguous, weighted emotions tells a fragmented narrative of “American masculinity, coming of age, and lost youth,” in MFA student Bradley Marshall’s “Hearing Through Walls,” photography exhibition, currently on display at Tipton Gallery in Johnson City, Tennessee. “Hearing Through Walls” opened on Feb. 19 and the closing reception will take place on March 2 from 6-9 p.m. 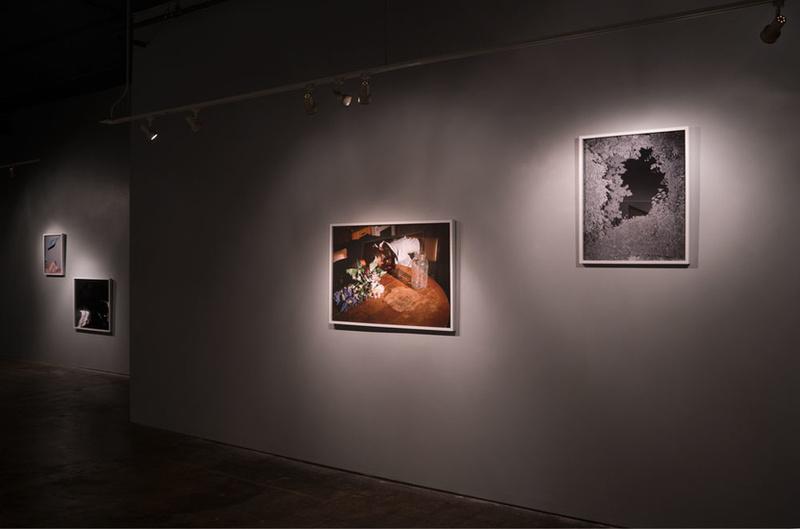 The exhibit consists of numerous large archival inkjet prints, produced primarily from photographic film scans. There is also a dual-screen video projection accompanied with sound. Bradley Marshall received his Bachelor’s degree from MTSU. Currently, he is teaching Digital Photo as a Graduate Assistant. This body of work is arranged from Marshall’s three-year study on American masculinity which originated in Nashville. The deviant arrangement of the work, in addition to the large frame, size challenges the formulaic tradition of installation, “They’re hung this way because it invites the view to engage differently…I wanted to try and break out of that tradition of museum standard. [The viewers] build their own stories from these pictures,” said Marshall. With the subjective intent, Marshall’s work allows viewers to connect and “Revisit that feeling of growing up—in that coming-of-age narrative, or maybe bring to light a possible reading of tumult or conflict and tension in contemporary America,” said Marshall. The images display themes such as knife play, desertion of the home/suburbia, party scenes and isolation. The video installation visually portrays, “…Social behavior, the throwing of knives and breaking of windows…ways of fighting boredom that are also somewhat violent.” The sounds included, albeit natural, provide a startling mix of springtime outdoors, bird noises and the sudden clattering of a broken window. The title “Hearing Through Walls,” thereby echoes through the gallery. Marshall’s featured image, seen on the exhibition show cards, pairs classic symbolism with a banal figure. The photograph displays a young man with a small, curious midriff abrasion who stands in a mannequin-like position and faces away from the lens. In the shadow of artificial, almost surreal lighting, a hand gestures loosely towards the young man. This exhibition is led by The ETSU Department of Art and Design and ETSU’s Tipton Gallery. Tipton’s hours are Wednesday and Thursday, 4-6 p.m. They are also open for first Friday receptions and by appointment.